The themes of the literary Gothic have been translated into other media such as the theatre and had a notable revival in twentieth century gothic horror films such the classic Universal Horror films of the 1930s, Hammer Horror, and Roger Corman's Poe cycle (Davenport-Hines 1998: 355-8). In the early 1960s, American International Pictures gained some kudos by combining Roger Corman, Vincent Price and the stories of Edgar Allan Poe into a series of visually impressive horror films. This series of movies made AIP an American counterpart to the British studio Hammer Films and its famous Hammer Horror line featuring Peter Cushing and Christopher Lee. The original idea, usually credited to Corman, was to take Poe's story "The Fall of the House of Usher", which had both a high name-recognition value and the merit of being in the public domain, and thus royalty-free, and expand it into a feature film. Corman convinced the studio to give him a larger budget than the typical AIP film so he could film in color and create lavish sets. The success of The House of Usher led AIP to finance further films also based on Poe's stories. The sets and special effects were often reused in subsequent movies (for example, the burning roof of the Usher mansion reappears in most of the other films) making the series quite cost-effective. All the films in the series were directed by Roger Corman, and they all starred Price except The Premature Burial, which featured Ray Milland in the lead. It was originally produced for another studio, but AIP acquired the rights to it. As the series progressed, Corman made attempts to change the formula. 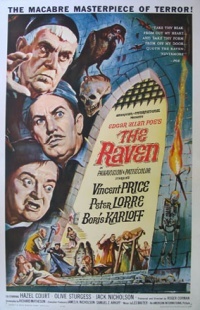 Later films added more humor to the stories, especially The Raven, which takes Poe's poem as an inspiration and develops it into an all-out farce starring Price, Boris Karloff and Peter Lorre; Karloff had starred in the 1935 version. Corman also adapted H. P. Lovecraft's story "The Case of Charles Dexter Ward" in an attempt to get away from Poe, but AIP changed the title to that of an obscure Poe poem, The Haunted Palace, and marketed it as yet another movie in the series. The penultimate film in the series, The Masque of the Red Death, was filmed in England with an unusually long schedule for Corman and AIP. The film, inspired by Ingmar Bergman's The Seventh Seal, looks much more opulent than the rest of the series. Although Corman is generally credited with coming up with the idea for the Poe series, in an interview on the Anchor Bay DVD of Mario Bava's Black Sabbath, Mark Damon claims that he first suggested the idea to Corman. Damon also says that Corman let him direct The Pit and the Pendulum uncredited. Corman's commentary for Pit mentions nothing of this. Vincent Price also recorded dramatic readings of Poe's short stories and poems, which were collected together with readings by Basil Rathbone. Unless indicated otherwise, the text in this article is either based on Wikipedia article "The Corman Poe cycle" or another language Wikipedia page thereof used under the terms of the GNU Free Documentation License; or on original research by Jahsonic and friends. See Art and Popular Culture's copyright notice. This page was last modified 14:12, 9 August 2014.